There is a silent stress inside teachers, no matter how long you’ve been teaching. I know you’ve felt it, and I know you’ve even seen it. There are many times you feel alone. Things are starting to go wrong in your classroom, and you desperately try everything to fix it. You are looking at your math lesson for the day and you can’t even begin to understand the best way to teach it. Things go so horribly wrong that it brings you to tears and you feel stupid, embarrassed and frustrated. I saw it today in a new teacher’s eyes and it broke my heart. I wonder why it is this way. Don’t get me wrong, it’s great to problem solve and figure out things on our own. But so often I notice teachers struggle with things until it gets so bad that they finally reach out for help, and feel embarrassment and apologetic in the process. Why is it so shameful to ask for help? With the demands on us as professionals in this day and age, we can no longer do it alone. Collaboration among teachers, teammates and support staff needs to become embedded so deeply that it is okay for anyone to seek help. We should go about our day more slowly, and a bit more kindly to ask others what they need. Instead of cutting out that last little laminated magnet star to put up on your locker to make it look cute, ask the new teacher next door if they are ready for their math workshop set up. Let’s promote a culture of asking and receiving in our schools. Our students deserve it. This is a funny title for a post because I have to say that this math book hasn’t “changed” my teaching exactly, but it has opened my eyes to how we can simplify our teaching. I’m reading Building Mathematical Comprehension: Using Literacy Strategies to Make Meaning by Laney Sammons. I chose to read this book because with all the demands in our teaching profession, I was seeking a way to simplify things. We cannot get everything done in a day, a week or even in a school year, so I keep thinking that there has to be a way to integrate things so that we aren’t going crazy every day. 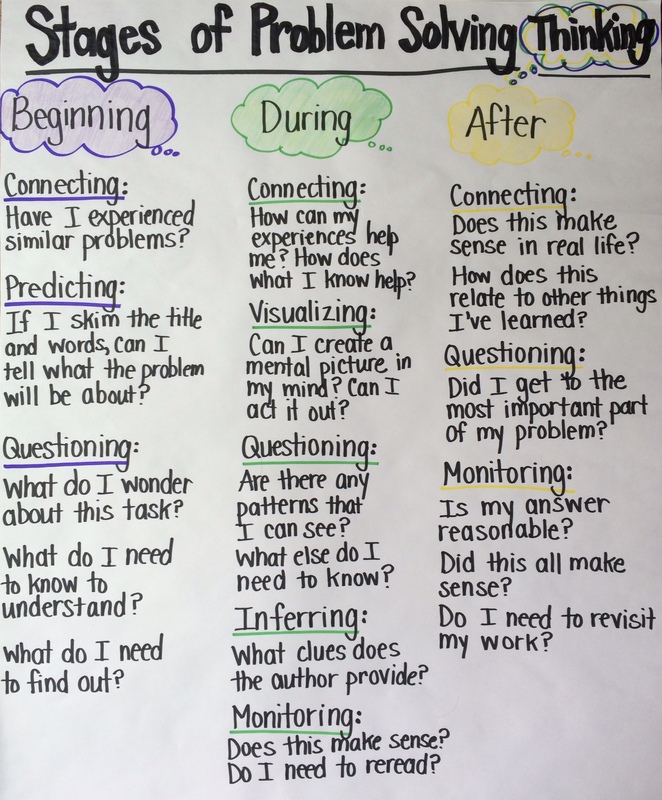 I say that it’ll look “something” like this, because I want to come up with the anchor chart WITH the students. I think doing a problem as a whole class (and using a think-aloud strategy) would help them see the kind of thinking that should be going on in your mind while problem solving. This book has even more literacy strategies that you can use in your math classroom. Using some of the same vocabulary in your math and literacy blocks can help students make great connections! To win a copy of this book, you will have to enter by clicking the link below. There are a bunch of us talking about great books that have changed our teaching, so don’t forget to check out Mr. 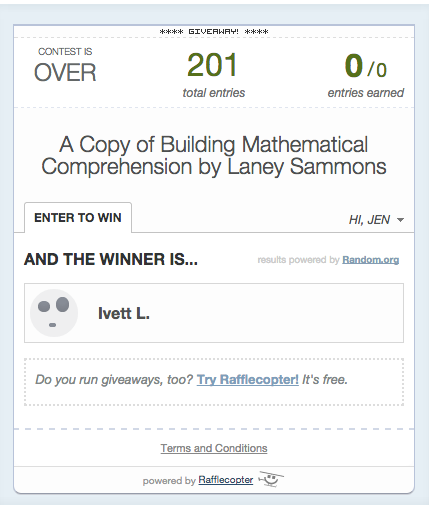 Elementary Math’s book, he is next in this blog hop. Pretend with me for a moment, that you have never seen an apple before in your life. Now pretend that someone has asked you to peel it, but you’ve also never peeled anything before in your life. How do you know what to do to be successful? How will you know when you have been successful? That in a nutshell is what “success criteria” is. 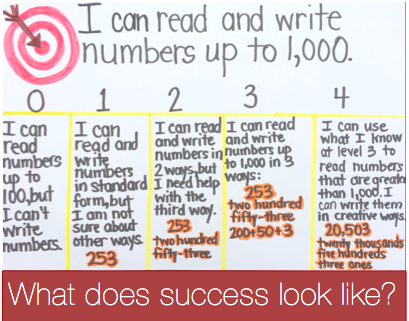 It’s all about letting students know what success looks like, and how they will know that they have met the learning target. In my mission to examine learning targets and communicate them, I learned that it wasn’t enough to simply display them for students. It STILL wasn’t enough for students to write them in their math journals. My students needed to see the learning target, write it, and then have some sort of interaction with it. This is where I combine this idea of success criteria (Hattie 2012) with Marzano’s Levels of Understanding. Using success criteria in the classroom can help students understand the outcome of their learning. I use Marzano’s Levels of Understanding to anchor my thinking (which I blew up and posted on the wall-this is a free resource by the way!) because the students connect easily to the language. After I show them what each level looks like, I have the students rate themselves on the current target. Their goal is always the same every day, get to the next level, get higher and get better. After this mini intro, I teach the lesson. We practice with tiered examples so that everyone is challenged, we talk it through with each other, we help each other come to an understanding. We break into independent practice work where I can catch the students who still feel like a 1 or 2. Then we close the lesson with an exit slip or an assignment, rating ourselves once again to see where we fall on the scale. I take a look at what they wrote for their final rating and catch those students during the review, intervention block or some recess time the next day. This seems like a lot of work, and I won’t lie that at first it was for me. It was a different way of thinking. But soon after I started to do this, I noticed that it was easier and easier to think about what a 0-4 looks like. If I ever skipped the rating part, my students would actually shout at me “What does a 3 look like? !” They wanted to know what it would take to be successful! It was very powerful. You may not have time to write it out like this for every lesson, but you can do it orally while referring to the levels on the wall. This tweak to my instruction was a total game changer. Thank you John Hattie and Robert Marzano for your inspiration! 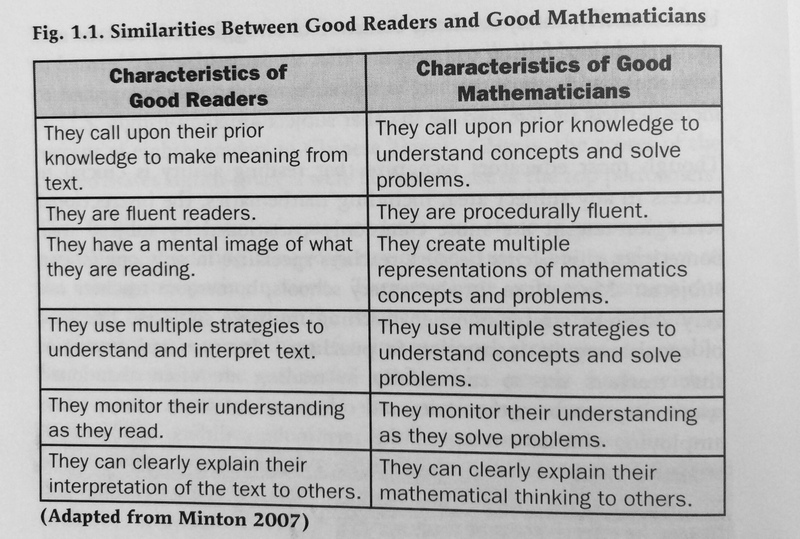 With all of the current criticism about the CCSS and “Common Core Math” (I put that in quotes because that phrase has been driving me crazy, now that is another blog post in my mind), I’ve been happy to see that the Standards for Mathematical Practice have been left alone. I’m glad that they’ve been left alone in the criticism because the Math Practice Standards are all encompassing thinking habits, more than they are standards to be met. They encourage us to teach mathematics more as a learning subject than a performance based subject. Math absolutely should require lots of messy critical thinking, deduction, discussion and reasoning. The math practice standards are a set of math habits, ways in which we should think about math. (That sounds so simple, but the way the standards are worded, it has driven many of us crazy while trying to understand them. Reason abstractly and quantitatively? Huh? It sounds like a completely different language!) The standards are all about developing positive habits and attitudes about math. They allow students to explore math as a learning subject. They begin to understand that math is not about the teaching asking a question, and the student must answer it correctly. Most importantly they begin to see the connection to their lives. Math connects so beautifully to real life, but because the U.S. has such a worksheet culture, we’ve lost that connection. Math from K-12 has the same underlying theme with these standards. As the years tick by the content standards become more complex, but the practice standards remain the same. With the Standards for Mathematical Practice, we can develop a very positive culture surrounding mathematics. A culture of persevering when encountering a problem, making sense of the world with math, using prior knowledge to solve new problems, being precise and reflective, patterning to find faster ways of working, explaining our thinking, understanding others thinking, knowing what tools will best help to solve problems, and connecting the world with abstract numbers and symbols. This all makes us excellent THINKERS. We’ve had math coaches, administrators and other teachers pass out posters to put up in our classrooms. We’ve seen freebies and posters that we are meant to download and print. We’ve put them up on our walls with very few of us digging in to what they actually mean. I WAS one of those people. I had a poster of the kid friendly standards up for two years, and it wasn’t until last year that I realized one of the standards was completely inaccurate on the poster. I had never bothered to check, and I assumed that the source knew the standards. Can you blame me? I didn’t have the TIME to dissect what each one means. It felt like another thing…another plate to spin…another added responsibility. I truly didn’t understand the importance of the standards to create a culture. When I decided to figure out what they really mean, introduce them to my students from the start of the school year, work through the problems with them, and embed the language in the classroom, the culture really changed. We became mathematicians who could work through anything. It was remarkable. We put our work on the walls to help remind us that these were to be a part of our classroom daily. We truly became vicious problem solvers, we worked together and math was about learning. Math became FUN. Build a culture by introducing, working with and revisiting the Standards for Math Practice. Even if the Common Core goes away (which it most certainly will, and already is in many states), I will always keep the Standards for Mathematical Practice. It is a foundation in which we can all build upon, year after year! Did you know that there is not a “math gene” that makes us good at math? If you haven’t read this yet: Why Do Americans Stink at Math? I would highly suggest taking the time to read. The long and short of it, is that during the industrial revolution, we took the fast track and tried to teach math the fastest way possible. We taught shortcuts instead of conceptual understanding. This method of teaching allowed our students to go directly from their education into a factory job, but it did a great disservice to a generation. This is why people believe that they are “bad at math”. I would strongly recommend that you watch this video by Jo Boaler, of Stanford University. It is 20 minutes long, so if you can’t watch it all, try the first 8 minutes. In it she talks about how we need to make math a learning subject (exploratory, messy, open ended and challenging), not a performance based subject (math is only about answering questions correctly). To return math to being a learning subject, we can use rich open ended tasks, inquiry activities, real world projects and problems that encourage math talk and discourse! Please check out my free Reasoning Puzzle Set to try out an activity that will really get your students thinking and talking and most importantly, learning at high levels. Reasoning Puzzles to promote student to student math talk. These are most appropriate for 3 and 4th graders, but even could be beneficial for fifth graders that are not used to thinking this way! If you end up using them, I’d love to hear how it goes.